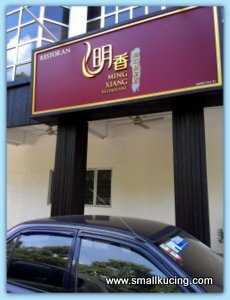 Some time last month, Mommy Ling informed Mamarazzi about RM38 Roast Duck Promotion at Ming Xiang Restaurant. 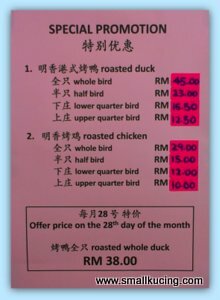 As stated in the sign, "Offer price on the 28th of the month; roasted whole duck -RM38"
Being kiasu, Mamarazzi "seven early, eight early"(very early) went to buy. 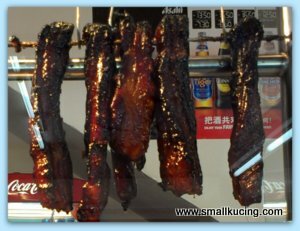 Wah.... saw glistering BBQ Pork. It was still early. Only saw a roast duck, a roast Chicken, Sausage and Roast Pork. The Waitress there said have to pre-ordered but the she consulted the Lady Boss. Since there is one Roast Duck hanging there, the Lady Boss told her to get it for Mamarazzi. While waiting, Mamarazzi also "tapau-ed" (bought) Roast Pork Rice for Papa. Recommended by Mommy Ling. Price RM3-90. Cheap. Also "Tapau-ed" Roast Pork Noodle for me. It came with a bowl of Wan Ton Soup. 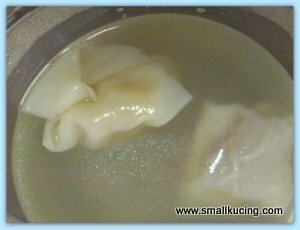 There was two wantan in it. Jeng! Jeng! The roast duck. Actually this is just half a duck. Not bad ya. Mamarazzi tasted. If Mamarazzi not mistaken, there are two types of Roast Duck. One is salty and one is sweet. The one at Petaling Street are the salty type while the one sold here are sweet type. Of the two, Mamarazzi preferred salty duck. However, the Ming Xiang Roast Duck was not bad. No 2 Jalan Bulan BT U5/BT, Bandar Pinggiran Subang, Sek U5, 40150 Shah Alam, Selangor. I love roast duck! I prefer the salty one though too. It's actually pretty hard to find where I live. I'm a little jealous! Ohhhhhh!!!! So this was where Yee Ling got the duck for me. Drool! Drool! Loved it, so very nice. Tell Papakucing, if he comes to Sibu again, I want the whole duck, ya! LOL!!! Can you believe I've never had duck before!? eih, RM3.90 for that roast pork rice and noodles are cheap woh..
but then looks so so only the roast pork.. the duck looks nicer..
hmmm, i will also prefer salty ones.. sweet one seems so weird right?? Nice review on the roast meat! Yum! Wa...looks juicy and must be aromatic too ! And cheap leh RM38 only for a whole roasted duck. Nice nice...worth your seven early eight early waiting there for the duck...Quack and Oink ! Ok...waiting for 28th of the month..LOL!! 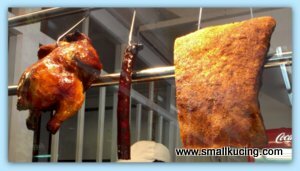 I was at a Chinese Restuarant last week and i must say i really enjoyed my roasted Duck meat.. I forgot to include that i prefer salty duck meat instead.. I love roast duck! But din know got sweet and salty. All the time I ate are salty taste. My My!!!! 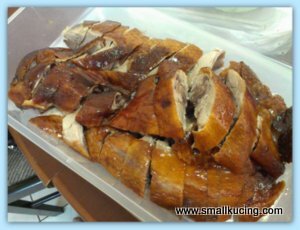 I simply love roasted duck and any type I will also go for. Looks really tempting and need to check out to indulge into. half a duck for 3 persons? hahas. does the sweet and salty one taste like char siew? I thought roast duck only got one type. RM38 is cheap lor. RM38 cheap loh!! Must try!! I love roasted duck. I also prefer salty duck, anyway their price is cheap for the whole duck. I heard of this too.. Look nice! cheap for locals to eat la .